Did you know that the companies that support or service your business can actually put you at risk for data theft? When it comes to protecting your business, confirming your vendors’, processors’ and service providers’ security is just as important as your own. It’s critical to know who they are and what security questions to ask them. Providers of software as a service - for example, do you have any business processes or data “in the cloud”? If they access your business remotely, find out if they use unique credentials (log-in and password) for that access, ones that are used only for your business and not for any of their other customers. Keep a list: Once you know who to call, keep company and contact names, phone numbers, website addresses, and other contact details where you can easily find them in an emergency. 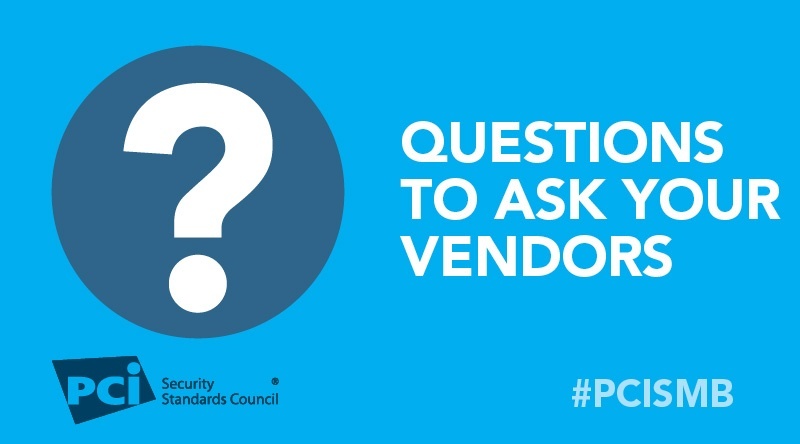 Confirm their security: Is your service provider adhering to PCI DSS requirements? If you are an e-commerce merchant, it’s important that your payment service provider is PCI DSS compliant too! Ask questions: Once you know who your outside providers are and what they do for you, talk to them to understand how they protect card data. Use Questions to Ask your Vendors to help you know what to ask.